Matthew Apgar - mapgar@shawmedia.com McHenry's Dana Walsh claps the hand of teammate catcher Carly Mattson, right, before Mattson's first inning at-bat against Cary Grove during their softball game on Monday, May 04, 2015 at McHenry High School West in McHenry. The duo would have reason to celebrate later as well when they both reached base with singles in the third inning. A courtesy runner in Maggie Wiegman took over base running responsibilities for Mattson and both Wiegman and Walsh would score on a home run by their pitcher, Kristin Koepke, who also picked up the win in the 6-0 game. 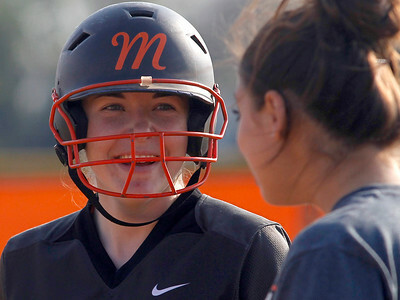 Matthew Apgar - mapgar@shawmedia.com Catcher Carly Mattson of McHenry shares a laugh with assistant coach Anna Snyder after Mattson reached first base on a third inning single during their softball game against Cary Grove on Monday, May 04, 2015 at McHenry High School West in McHenry. 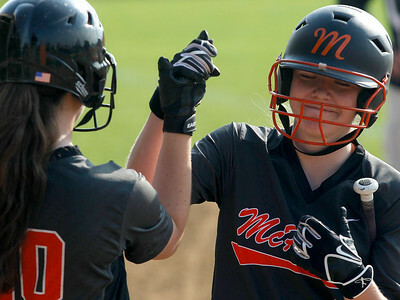 A courtesy runner in Maggie Wiegman would run the bases for Mattson, though not for long as she and Dana Walsh would be driven in by a home run from pitcher Kristin Koepke during McHenry's 6-0 victory. 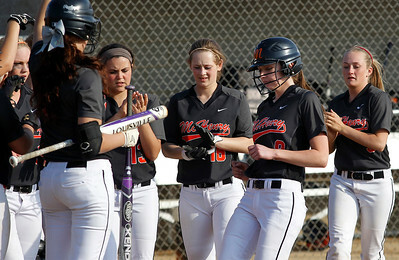 Matthew Apgar - mapgar@shawmedia.com McHenry pitcher Kristin Koepke, second from right, is met at home plate by her teammates after smacking a three-run home run in the third inning against Cary Grove during their softball game on Monday, May 04, 2015 at McHenry High School West in McHenry. McHenry won the game 6-0. 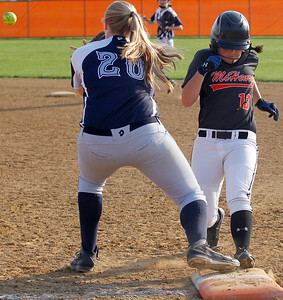 Matthew Apgar - mapgar@shawmedia.com McHenry first baseman Erika Breidenback gets the force out at first base on Cary Grove's leadoff hitter Kristi Isola during the first inning of their softball game on Monday, May 04, 2015 at McHenry High School West in McHenry. McHenry won the game 6-0. Matthew Apgar - mapgar@shawmedia.com McHenry pitcher Kristin Koepke slaps hands with coach John DiFrancesca as Koepke rounds third base after hitting a third inning three-run home run against Cary Grove during their softball game on Monday, May 04, 2015 at McHenry High School West in McHenry. 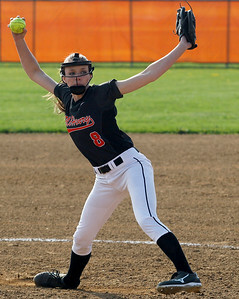 Koepke would pitched well too, as McHenry went on to win the game 6-0. 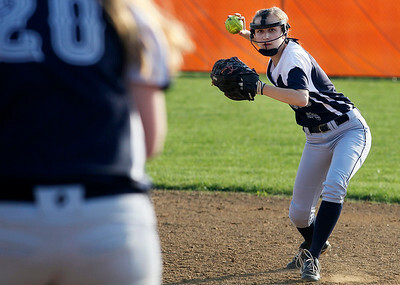 Matthew Apgar - mapgar@shawmedia.com McHenry pitcher Kristin Koepke fires the ball to a Cary Grove batter during the first inning of their softball game on Monday, May 04, 2015 at McHenry High School West in McHenry. McHenry won the game 6-0. 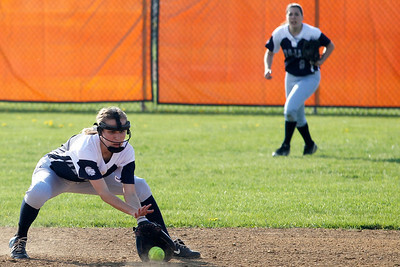 Matthew Apgar - mapgar@shawmedia.com McHenry's Maggie Wiegman dives safely back into first base, beating the throw to first baseman Brianne Prank from pitcher Caitlyn Adams during their softball game on Monday, May 04, 2015 at McHenry High School West in McHenry. McHenry won the game 6-0. 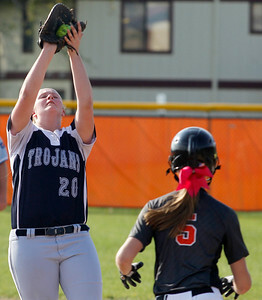 Matthew Apgar - mapgar@shawmedia.com First baseman Brianne Prank of Cary Grove catches the infield pop-up from McHenry's Amanda Manssen to record the first out of the second inning in their softball game on Monday, May 04, 2015 at McHenry High School West in McHenry. McHenry won the game 6-0. 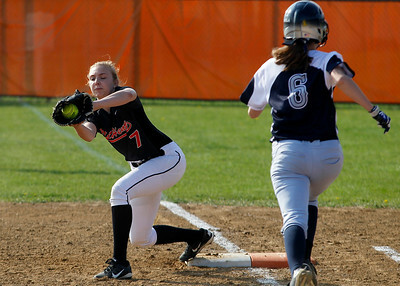 Matthew Apgar - mapgar@shawmedia.com McHenry's Hannah Crowley, right, safely returns to first base, beating the throw to Cary Grove's Brianne Prank in the fourth inning of their softball game on Monday, May 04, 2015 at McHenry High School West in McHenry. McHenry won the game 6-0. Matthew Apgar - mapgar@shawmedia.com Kristi Isola of Cary Grove fields the ball and would then complete the throw to first base to record the third out in the fourth inning of their softball game on Monday, May 04, 2015 at McHenry High School West in McHenry. McHenry won the game 6-0. Matthew Apgar - mapgar@shawmedia.com Kristi Isola of Cary Grove fields the ball and would then complete the throw to first base to record the third out in the second inning of their softball game on Monday, May 04, 2015 at McHenry High School West in McHenry. McHenry won the game 6-0. 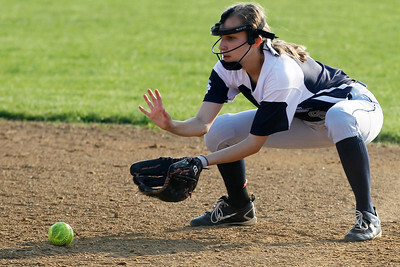 Kristi Isola of Cary Grove fields the ball and would then complete the throw to first base to record the third out in the fourth inning of their softball game on Monday, May 04, 2015 at McHenry High School West in McHenry. McHenry won the game 6-0.